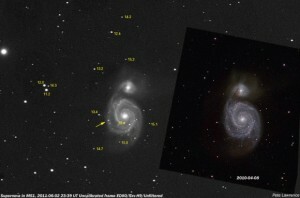 A new supernova (exploding star) has been discovered in the famous Whirlpool Galaxy, M51. M51, The Whirlpool galaxy is a galaxy found in the constellation of Canes Venatici, very near the star Alkaid in the handle of the saucepan asterism of the big dipper. Easily found with binoculars or a small telescope. The discovery was made on June 2nd by French astronomers and the supernova is reported to be around magnitude 14. More information (In French) can be found here or translated version here. The supernova will be quite tricky to spot visually and you may need a good sized dobsonian or similar telescope to spot it, but it will be a easy target for those interested in astro imaging. The whirlpool galaxy was the first galaxy discovered with a spiral structure and is one of the most recognisable and famous objects in the sky.